בשנת 2003, מכיל 137 עמודים, תירגום: Harold Schimmel. 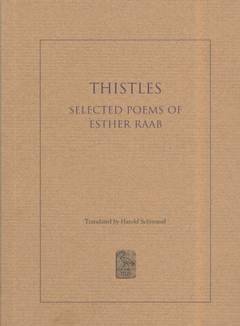 THISTLES - SELECTED POEMS OF ESTHER RAAB Translated by Harold Schimmel ESTHER RAAB was the first native - born Israeli woman poet and an Important if often - overlooked figure in the emerging literature of the Hebrew language. Her poetry, marked by its strong, ldiosyncratic Voico, is reminiscent of Emily Dickinson's in its unorthodox, fractured syntax, and its sources: the Bible and unromanticized nature. The daughter of one of the founders of Petah Tlkvah, the earliest Jewish agricultural settlement in Ottoman Palestine, Raab herself worked the land for a good part of her early years. In the early twenties, she moved to Cairo and married her cousin, a Jewish merchant. Returning to Palestine in 1926, she built a home in "little Tel Aviv"; there she hosted and formed close friendships with the leading Hebrew writers and painters of the burgeoning Jewish city. Raab's close connection with the land was embodied in her poetry - which is earth - bound, gestural, and above all painterly in its direct apprehension of her physical surroundings. Translator Harold Schimmel's selections for this volume drawn from all of the poet's books, constitute the first gathering of Raab's work in English and afford the reader an opportunity to relish what he calls in his introduction the "strange intensities" and "astounding propinquities" of a singular writer. ESTHER RAAB (1894 - 1981) was born in Petals Tikvah, Palestine and died in Tivoni Israel. HAROLD SCHIMMEL was born and raised in the United States and has lived in Jerusalem since 1962. He is the author of six collections of poetry in Hebrew and has translated into English books by Yehuda Amichai and Avot Yeshurun. Ibis Editions has published two volumes of his work in English translation: From Island to Island and Qasida.